Today’s guest blog post was provided by Laura Carlson, Vice President and Associate Provost, Dean of the Graduate School, and Professor of Psychology. This past August, the Grad School was awarded an $80,000 grant from the Council of Graduate Schools (CGS). 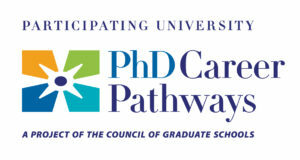 This funding allows us to participate in the PhD Career Pathways Project, a high-profile investigation seeking to better understand how and where doctoral graduates apply their educations professionally. ♣ We’ll strengthen our relationships with our amazing doctoral alumni. ♣ We’ll acquire a better understanding of the significance of doctoral education in the real world. ♣ We’ll learn how to better prepare our students for a wide variety of diverse career options, including all the traditional ones, too. We are now ready for the first step of the project: sending surveys on career pathways to the PhD alumni. We’re asking them questions about where they’ve landed since graduating from Notre Dame, and how they’re applying their expertise and education in their daily lives. I can’t wait to see those completed surveys. I already know that our graduate students’ research matters. I am reminded of this when I hear of the government tapping Sarah Lum to address the national sexual assault kit backlog, or when I read Emily Maiden’s blog as she helps combat childhood marriage in Malawi. But what I don’t always know—and the potential that excites me the most—is how our graduates are changing the world, in ways big and small, since leaving Notre Dame. Each and every student cultivated his or her impact while at Notre Dame. But what does that impact look like today? Once we have answers to these questions, we’ll ask more questions. It’s a three year project, after all. ♣ What can our current students learn from our high-achieving alumni? ♣ What features of our professional preparation approaches best served our graduates? ♣ What are some career platforms from which PhDs can change the world that we may not have thought of before? ♣ And how can we invigorate our professional development and career preparation to prepare students to shine in these roles? As we interpret our findings, we’ll collaborate with our graduate programs in STEM and Humanities, as well as our twenty-eight partner colleges in the study. Sharing our data with them—and seeing theirs—will be a huge asset. And we will feed these data to our Graduate Career Services Office to help that team strategize on the best ways to communicate out-of-the box career options to our students, and to implement tools to help them prepare for and obtain these roles. Our students’ research matters. I am #IrishReady to investigate how our alumni mobilize their research to be forces for good in the world today, and to brainstorm with us on the best ways to enable our current students to enter into this tradition of using their research to change the world. Have questions about the CGS Career Pathways Project? Leave them in the comments.